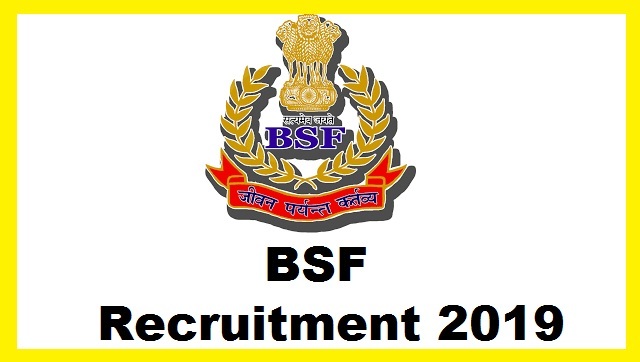 Border Security Force BSF Recruitment 2019 - BSF invites Online applications for recruitment of 1072 Head Constable Posts. This online facility will be available in the Official website http://bsf.nic.in/ from 14/05/2019 AT 00 :01 AM to 12/06/2019 AT 11:59 PM. Prospective candidates will have to apply online after carefully reading the detailed advertisement regarding the process of examination, eligibility criteria, online registration processes, application fee/ intimation charges, pattern of examination, Syllabus, How to Apply, Question Paper, issuance of admit cards/call letters, Exam Date, Result Date etc. Head Constable (RO) - Matriculation or equivalent from a recognized Board and .two years Industrial Training Institute Certificate (ITI) in Radio and Television or, Electronics or, computer operator & Programming Assistant or, Data Preparation & Computer Software general Electronics or, Data Entry Operator from a recognized Institute (Or) - Pass in Intermediate or 12th standard or equivalent with Physics, Chemistry and Mathematics from a recognized Board or University or Institution as a regular student with aggregate 60% marks in PCM subject. Head Constable (RM) - Institute Certificate (ITI) in Radio 'and Television or, General Electronics or, computer operator & Programming Assistant or, Data Preparation & Computer Software or, Electrician or Fitter: or, Info Technology & Electronics System maintenance or, Com Equipment Maintenance or, Computer Hardware or, Network Technician or, Mechatronics or, Data Entry Operator from a recognized Institute. Or, Pass in Intermediate (or) - 12th standard or equivalent with Physics, Chemistry and Mathematics from a recognized Board or University or Institution as a regular student with aggregate 60% marks in PCM subject.